Tino entered as the heel here, giving people dirty looks, and taking a knee and putting his fist to the ground pose in the center of the ring before the match. Even match, Bull took some hard shots before firing up for the win. Peyton entered first with new gear and a better than you attitude about herself tonight, she did a splits on the apron roll in to the ring, asked for the microphone and cut a short heel introduction promo about how she is "The Venus Fly Trap" of NXT. Asuka entered to a great reaction, she has a star aura about her. Well worked match, a couple fun Asuka comedy spots mixed with serious action. Hopefully we see more of these two in the future. Riddick Moss beat Levis Valenzuela Jr. These two have been working around the state lately, Levis has so much charisma while Riddick shows a lot of solid WWE Style wrestling ability, he's under control and everything he does is done well. Indian music hit as three men in all black made their way to the ring, they were Sunny Dhinsa, Gzim Selmani and Lovepreet Sangha. Heel promo about how they want us to stand up and show our respect, one of which said he came from a rich oil family. They received the WHAT? treatment from the crowd. This was a fun match, Hugo's dancing and party boy personality is easy to enjoy, and Tye can work as a heel whenever he chooses yet his Perfect Ten gestures still get a positive reaction. After the bell rang, Dillinger said this would be no dance contest, so of course this made Hugo demand a dance contest. They took turns twerking and dancing before Dillinger took a cheap shot on Hugo to get the match going. Champs won with the assisted codebreaker type maneuver they are using these days. 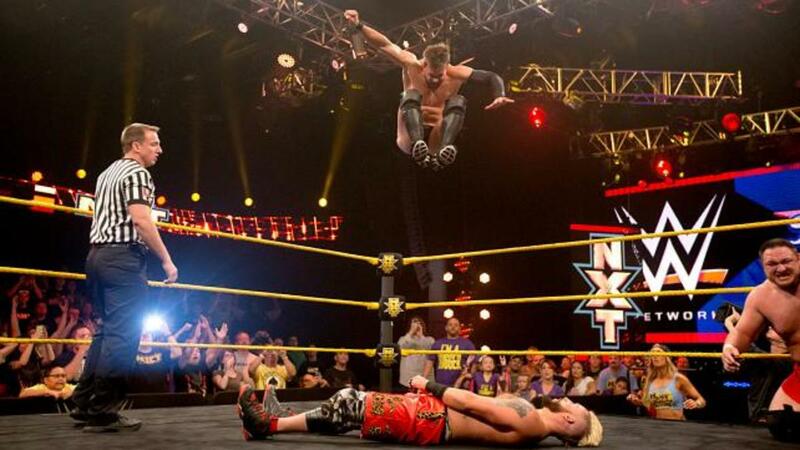 Very good match, as Gable & Jordan have broken through as one of the most popular acts in NXT. Scott & Dash are good old fashioned rough and tough workers and the dynamic between them and the technical wrestling of Jordan & Gable is excellent. Post match, the heels were still laying it in on the faces so Enzo Amore ran them off to a big reaction. Enzo promised that Big Cass would be back and they were going to get payback on Dawson & Wilder. Enzo shook Gable & Jordan's hands, endorsing them before leaving. Crews won with a big slam, similar to the Blue Thunder Bomb, good finisher, still need it to get more tv time so crowds will know that's what he's going with these days. Very strong match here, two large men hitting major moves and selling the damage between them. Brawling and felt like a fight. Good guys won when Bayley hit the Belly-To-Bayley on Aliyah. Despite using the name Marley at the recent taping, Gionna was introduced as this name, also Aliyah is what Nhooph was introduced as even though Breaking Ground focused on her so much. The majority of the match saw Emma or Billie Kay working over Adrien or Gionna, crowd was very in to Bayley, calling for her with chants and singing songs to which Emma even danced a bit to, which received a "You're Still Evil!" chant. The finish saw Gionna go to the top for a big cross body on Aliyah after Bayley had tagged herself in to then hit the huggplex on the unsuspecting Aliyah. It's great to see these types of matches because Bayley and Emma are able to keep everything together and teach the wrestlers around them by guidance or watching their actions. Joe was out first to make sure he was the heel, spoke about how Finn was a coward and should have just given him the title match he deserved. Went on to trash Citrus Springs, calling it a "podunk town". Joe claimed he hadn't seen Finn all day but he was here for a fight, the lights went out and Finn's music hit to a big reaction, lights came back on quickly as Finn in his hoodie had hopped the barricade to sneak attack Joe. They brawled as the bell rang for this match. Joe was able to cut Finn off and really laid in to him with punches and stomps. Joe looked ferocious tonight, a dangerous, calculated heel. Finn would fire back to keep the crowd in to it and always showed fire. They teased the ref bump a few times until finally there was one, during this time Joe grabbed the NXT title and was winding up to hit a belt shot, Finn ducked it, was able to hit the running dropkick to the corner and get up to the top for the Coup de Grâce. Bálor celebrated this big win to send everyone home happy.